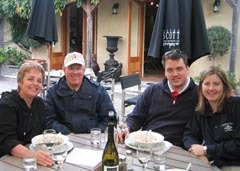 The Wine Peeps are a family team consisting of two couples, Kori and Colby Voorhees and John and LaGayle Sosnowy. The primary contributors on this blog are the daughter and father duo of Kori and John. In this blog, we are collaborating to share with our readers the most important things we have learned about selecting, tasting, and enjoying wine. In our travels through wine country from California to France, from Oregon to Australia, from Washington State to New Zealand, from British Columbia to Niagara-on-the-Lake, from Texas to South Africa, from Chile to Italy, we have observed the great, the bad, and everything in between in the world of wine. We have hosted regular wine tasting dinners since 2002 where we taste six different wines, usually of one varietal, in a blind tasting. In addition to our tasting dinners, we also have regular private tastings of two different wines blind with dinner and have hosted a wine tasting group. Both Kori and John have earned the coveted Certified Specialist of Wine (CSW) credential from the Society of Wine Educators, passing the difficult qualifying examination that covers a broad range of topics including viticulture, grape varietals, wine production, wine regions of the world, and wine tasting. The Society of Wine Educators was established in 1977 and is the leading international non-profit organization dedicated to wine education. As a regular reader of this blog, you should be able to learn everything you need to know to be a savvy wine consumer and to impress your friends with your knowledge of wine. Kori is the primary tasting gal on this team, and John is the numbers guy, helping you to get more bang for your buck. We learn something new every time we taste a wine, visit a winery, walk a vineyard, or talk to other wine enthusiasts. No one knows all there is to know about wine; a wine lover’s learning curve lasts a lifetime. We share what we have learned with you and hope that you will share your knowledge and comments with us. 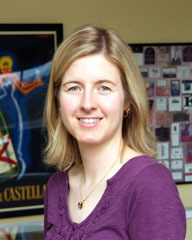 Kori Voorhees is a wine writer and consultant based in Seattle, Washington. She is a Certified Specialist of Wine and Editor-in-Chief of Wine Peeps, an independent wine blog, where she writes about wines, wineries, wine-related products and services, and the wine industry for a consumer audience. Wine Peeps has ranked as high as #6 in the world’s Top 100 Wine Blog rankings. She has also written for other wine publications including Washington Tasting Room Magazine, Wine Press Northwest, and Palate Press: The Online Wine Magazine. In addition, she is a member of the Wine Century Club. 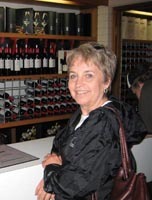 A freelance writer since 2001 with experience in book, magazine, online, and business writing, Kori also consults on wine tourism and wine education programs. She has served as wine consultant for the largest private transportation company in Washington State, working to advance their wine tour division. She received her Bachelor of Arts in Business Administration with a Marketing concentration from the University of Washington. In addition, Kori is a PTR-certified tennis teaching professional and works part-time as a tennis instructor at Nordstrom Tennis Center on the University of Washington campus. Kori enjoys wine, reading, tennis, traveling, attending University of Washington sporting events, and spending time with family. She lives in Seattle with her husband Colby and daughter Sydney. 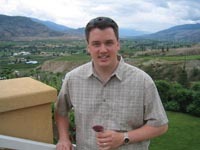 John K. Sosnowy is a Certified Specialist of Wine and is the Wine Peeps’ numbers guy. Through research and statistical analysis, he seeks the best values to help the Wine Peeps and our readers get more bang for the buck. He is also a member of the Wine Century Club. John has been in the investment business for over forty years, most recently as president of Sosnowy Investment Management Company (SIMCO) and vice-president and portfolio manager of Flexible Plan Investments, Ltd. During his decades of investment management experience, Sosnowy has been a nationally recognized pioneer in tactical asset allocation/risk management strategies. He is the founder and a past president of the National Association of Active Investment Managers (NAAIM), an industry national trade association. His investment philosophy has been featured in Forbes, Financial Planning, Investment Advisor, Newsweek, Research, Technical Analysis of Stocks & Commodities, and many other national and regional publications. He has been a guest on the CBS Evening News and hosted Money Talks, an investment radio show. John is a member of the American MENSA Society and holds a Bachelor of Science in Mathematics and a Master of Science in Industrial Engineering from Texas Tech University. He resides with his wife LaGayle in Seattle, Washington. Colby Voorhees is the computer whiz/tech support guy and primary photographer for winepeeps.com. 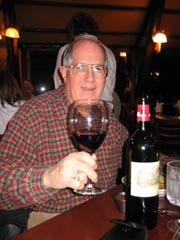 He is also an avid wine enthusiast and contributes from time to time on items of interest including wine inventory systems, cellar tracking software, wine photography, and so forth. Colby is a Senior Healthcare Consultant at Slalom Consulting. He enjoys photography, traveling, and attending UW sporting events with his wife Kori and daughter Sydney. Colby holds a Master of Science in Information Systems from the University of Washington and a Bachelor’s Degree from Washington State University. LaGayle Sosnowy is the food and cooking expert on the Wine Peeps team. She is also an avid wine enthusiast and contributes from time to time with food and wine pairing challenges, recommendations, and recipes. LaGayle was a full-time fundraising volunteer in the University of Washington Athletics Department from 1998 to 2009. She and her husband John are avid fans and supporters of Husky sports. She is also a voracious reader. LaGayle has a Bachelor’s Degree from the University of North Texas and a Master’s Degree from Lamar University. She was a high school business teacher for ten years. It should be noted that we have no financial interest in any winery or vineyard. We have not received any remuneration for any favorable comments made herein. We do accept trade samples, but the vast majority of products we review have been purchased at retail. Any references to or any recommendations for any wines or wine accessories reflect only our honest opinions from our journeys through wine country and tasting many, many wines. It’s hard work, but someone has to do it. Enjoy!